STC Annual Meeting was November 13th. Big thanks to our guest Dr. Bill Rose who illuminated an intrigued group on how Swedetown’s geology is like icing on a hot chocolate cake. We certainly added to our knowledge of what is underground below our trails. STC Monthly Board Meetings are open to anyone interested. Upcoming meetings are March 19th, April 9th and May 14th at 7 p.m. in the Chalet. All season pass holders are Club members. 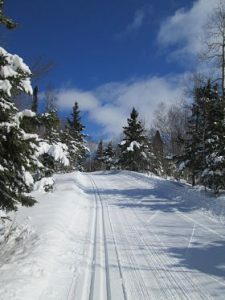 Winter Trails Day is a national event with 100 locations around the country. Swedetown’s 2019 Winter Trails Day was a great success. The idea is to introduce people to new outdoor activities to stay active in winter. With fine weather and great snow, we had over 130 people trying out the trails, snowshoes, skis and snow bikes. Thanks everyone for coming and much thanks to Cross Country Sports for supplying rental gear for no charge. Great Bear Chase 2019 ski marathon on March 9 had over 800 racers, a new record. Thanks volunteers for coming out and helping with the race. With very good weather and good snow, everyone had a nice day for competition. Come back again next year! Easter Bunny Hoppet and Easter Egg Roll – 20km freestyle and 20km fat bike event were held of Saturday, March 31 to celebrate spring skiing and snow biking at Swedetown Trails. Thanks everyone who participated, we all had fun! Experience the Keweenaw! In May this event featured three days with 30 different outdoor experiences to try. Swedetown Trails hosted a group bike ride with 65 riders who enjoyed their trail ride plus post-ride social time and food provided by Cross Country Sports and Portage Health Foundation. Great Deer Chase 2018 Mountain Bike races were part of Calumet’s PastyFest on August 18th. We had a new start/finish area at the Chalet and everyone enjoyed the race.